In May, Save the Manatee Club added a new manatee to the Adopt-A-Manatee® program. The most recent adoptee is named Una, and she is a winter visitor at Blue Spring State Park in Orange City, Florida. Una was recently released back into the wild after undergoing treatment for monofilament entanglement. She had suffered the entanglement for three years. Una has scars on both flippers where monofilament line became entangled and embedded. Una was initially rescued as an orphaned calf from the Ortega River near Jacksonville, Florida, in December 2003. She was taken to SeaWorld Orlando and released three years later with several other manatees at Blue Spring State Park in Orange City, Florida. By that time, Una had grown to over eight feet in length and was 980 pounds. To make sure she was adjusting to life in the wild, Una wore a tracking device so her movements could be monitored. Rescued as an orphan, Una was released back into the wild. Since her release, she has had three calves and has been known to visit the warm water refuge at Blue Spring State Park in the winter. After the Jacksonville incident, Una reacclimated well to life in the wild. She was known to travel in the St. Johns River and continued to visit Blue Spring in the winter. She brought in her first calf for the 2010 – 2011 winter season and had another calf named Flower in 2013 (this is a “baby name” and not permanent until the calf has identifying scars). Then in November 2013, Una came into the park with fishing line entanglement on her right flipper. The next season, she came in with line entanglement on her left flipper. Unfortunately, plans for a capture were unsuccessful both years. The following season, Una came in to Blue Spring with even more fishing line entanglement that connected both of her flippers. Luckily, the connecting line was able to be cut, but line on each flipper remained. A rescue was again considered until researchers noticed that she was pregnant. Finally, in November 2016, Una and her large calf were captured and transported to SeaWorld Orlando to have the embedded line removed. Una and the calf, named “Mr. Baby,” were released on December 12, 2017 at Blue Spring State Park. Mom and calf went their separate ways as Mr. Baby was weaned by this time, and Una has done well since her release. “Una behaved as if she hadn’t been away,” said Wayne Hartley. Wayne also reports that Una typically has a three-year birthing interval, so we will be watching to see if she might be pregnant next season! Each person who adopts Una will receive a full-color photo, biography, and adoption certificate, as well as a membership handbook and subscription to The Manatee Zone, a newsletter featuring updates on the adopted manatees when they are sighted, and Paddle Tales, Save the Manatee Club’s bi-monthly eNewsletter. 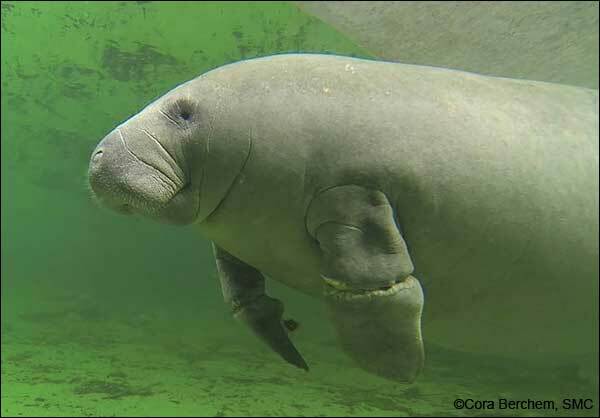 Proceeds from adoptions of Una will go to the Manatee Rescue & Rehabilitation Partnership (MRP), a cooperative of agencies, organizations, and oceanaria with a mission to rescue, rehabilitate, and release manatees (Save the Manatee Club is a charter member and MRP partner). For more information about adopting Una, go to Save the Manatee Club’s Adopt-A-Manatee® page, or call 1-800-432-JOIN (5646). 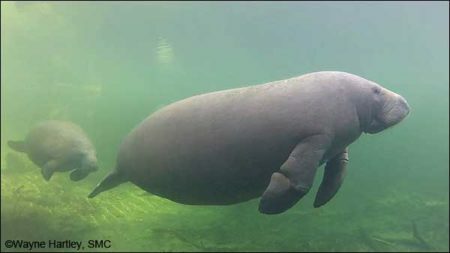 And be sure to watch for Una and other manatees on the Blue Spring webcams at ManaTV.org and read updates from Manatee Specialist Wayne Hartley.